Growing up I was a picky eater. I remember on more than one occasion being held back at the table because I didn’t finish my plate. So I’d sit and wait until everything was quiet and then I’d fill up my napkin with the offending food item and flush it down the toilet. Good riddance. Tomatoes made me gag. Raw onions were disgusting. Jello still makes my skin crawl. Don’t even let me think about melons. Cucumbers have always been on the oh-hells-no list. But then things began to change. A few years ago I was fine with a slice in my sandwich. It provided crunch and a subtle freshness that I appreciated. And then, I made tzatziki and a creamy dill salad and I was slowly coming around to its charms. It became a regular in other salads and as a dipper for hummus. So now I can say with a clear heart and head that I’ve made progress on the formally hated food front. And I can provide a tip if you aren’t a cucumber fan either and want to become friends: when you cut into your cuke, scrape out the seeds with a spoon. That’s it. That watery mess is the equivalent of a textural heebee-jeebee and has no business near your salad. Now, let’s get to this salad because it’s a good one. I whipped up a lovely Sunday lunch recently of roasted potatoes, breaded baked sole and steamed spinach, but I wanted a bit more flavour on the plate. This salad came to the rescue and provided a nice tart bite. The lemon shines and the dressing is tart but balanced with a bit of honey (though agave syrup would be a lovely substitution for a vegan salad). If I had fresh dill, I probably would have tossed some over top, but this salad needed no extra help. elsewhere: At Poppytalk last week I made a rice noodle salad with shrimp and vegetables. Cut the cucumber in half, lengthwise and scoop out the seeds if desired. Me, I scrape ’em out every time. Slice into thin half moons and place in a serving bowl. Add the thin slices of onion to the bowl along with the lemon zest. To make the dressing, combine the lemon juice, garlic, olive oil, honey and salt and pepper in a small lidded jar. Shake until combined. Taste and adjust seasoning if necessary. Pour over salad, toss, and serve. This looks so great and refreshing! I printed a recipe for something similar yesterday. YUM! i have to admit, I’ve never been much of a cucumber person either but I have a feeling this salad could tempt me! This sounds like the perfect light accompaniment to a healthy little dinner. I might have to take this one on my first potluck picnic (can you believe it’s finally potluck picnic season? phew!). Good for you overcoming the dreaded food! Have you ever tried English cucumbers? They don’t have the soupy seed mess in the center. They’re a bit spendier, but very nice. 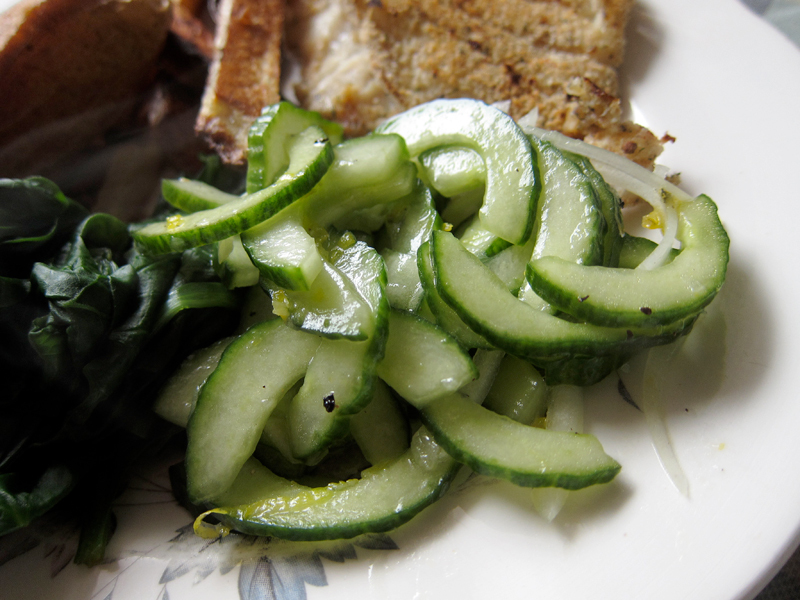 One of my favorite snacks as a kid was slices of cucumber sprinkled with salt. Weird child, I know! I still love cucumbers, especially the ones that come out late summer in the market. No pesky watery seeds. This is a perfect way to treat them in my book – subtle and lovely. This salad sounds wonderfully fresh and yummy! It’s on the list to try. Thanks BITNB! I love this recipe for its simplicity. Meister, picnic potluck ideal! It’s not quite picnic season here yet, sadly. I hope you give it a try, Brandy. It’s a good one. What? You weren’t a cuke fan? Or tomato fan? Or onion fan? Those 3 veggies were always a staple in my house. Guess you can’t be Greek without them lol. 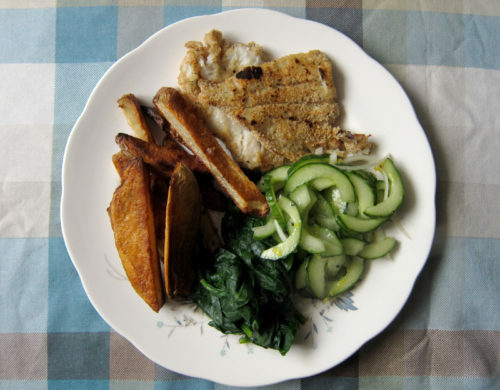 As a kid, I was always held back at the kitchen table when I refused to eat my fried fish with head and tail intact. I wasn’t creative enough to wrap up the entire fish and flush it down the toilet. But then that may have posed another issue. Good to hear that you are no longer anti-cucumbers. Have you tried the mini English cucumbers? There’s nary a seed in them and they’re refreshing and crunchy. One thing I do agree with you is the grossness of jell-o. That stuff always seems to activate my gag reflex. Shiver! Scraping the seeds of out cucumbers also keeps them from inevitable mushiness. I got into the habit in Japan, when I’d make quick pickles (rice vinegar, salt and sugar) with these rather tiny cucumbers (about the length of my hand). Just using the flesh of the cuke and soaking them in the brine for an hour or so made for a delicious and light salad/side. This salad looks lovely. Bookmarked! Ha! This post put a smile on my face because I did the exact same napkin trick growing up and I’m the same way about Jello still too! Cucumbers aren’t my fav veggie, but they do end up in my basket once in a while because I feel like I should like them more. I’m going to try this salad out, sounds great! Lemon and cucumber—I like that very much. Maybe I’ll zest the salad tonight. Hello Spring! Bijoux, nope – I was the pickiest kid ever! I only started liking raw tomatoes recently too. I’m growing up, slowly 😉 And I’ll look for those mini cucumbers – I’ve seen them around! Gwendolyn, sounds like a perfect side – I’ve always loved pickles! Oh you should Tracy, it does seem very springlike on the plate. Sometimes I think we might be just a little bit psychic. Because for one, I’m totally in love with cucumbers right now after having been bored of them for years, and for two, I was just thinking about how much less picky of an eater I am as an adult than I was when I was a kid. Hooray! What a simple elegant recipe. I make a similar salad but without the garlic. That looks like a great addition. Thanks! I made this with dinner tonight! I ended up using shallots instead of onion, which probably doesn’t change things too much. It was quite tasty! I didn’t even share with the boy-fiance. I think this will definitely be a staple in our house from now on! I can’t seem to get enough of lemons these days. I’ll be making this one on the weekend. Looks fresh and delicious! Yes, Kimberly, let’s be psychic together! I wish I was totally cured of my pickiness, but I’m definitely coming around. Thank you, Rivki! I think you could easily skip the garlic here if you wished. Whitney, so glad you liked the salad. Yes, it’s a staple here too. Alexis, give it a try! No seeds FTW! Me too Kirstin, I’m in love with lemons – brightens everything up so nicely. WINNER. thanks a lot for this. 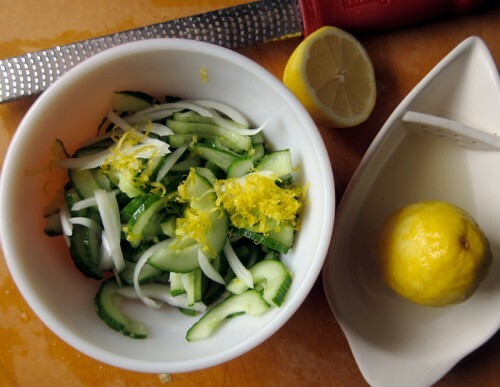 and much easier than the traditional cucumber salad that has to sit overnight. jacobspence, glad to hear it! Growing up, I was super picky too and the only dressing I liked was lemon juice with salt. And even now it’s kind of my fav.